2. What are the State Papers Ireland 1509-1782? This guide will help you to navigate the State Papers Ireland, the key resource at The National Archives for researching the social and religious history of Ireland between 1509 and 1782. All communities are represented in these records, including the Gaelic and Catholic Irish, Ulster Scots, Protestant English settlers and the descendants of the 13th-century Anglo-Normans. State Papers Ireland are also essential for tracing Irish ancestry back to the 16th century. These records cover all sides of royal government and include correspondence and other papers either written by or representing officials in Dublin, privy councillors serving the monarch in London, and inhabitants of Ireland seeking royal favours or justice. The State Papers Ireland are made up mainly of correspondence between the monarch’s secretaries of state in Whitehall and the government of Ireland in Dublin. They are the most important source of information on the governance of Ireland in the early modern period and, in the main, contain official and private letters between the crown’s representatives in Ireland (lead by lord deputy or lord lieutenant) and the monarch’s officials in London. Within the State Papers Ireland it is possible to trace the expansion of the English state from the early 16th century, through the periods of conflict and consolidation of the 17th century, to outright control by the 18th century. This once disparate set of records was reorganised into a more coherent collection in the 19th century, drawn together from papers held by the former State Papers Office, as well as from the Treasury of the Exchequer and numerous other sources across The National Archives. The destruction of the Public Record Office of Ireland in 1922 resulted in the loss of the archive of the English government in Ireland from the 13th to the 20th centuries. This guide also highlights where to go to consult records that were housed in Dublin and transcribed before the PROI was destroyed. All of the State Papers Ireland have been digitised and are available to view on State Papers Online (£), which is free to view at The National Archives or via universities and research institutions with a subscription. You can also view the State Papers on microfilm in the Map and Large Document Reading Room at The National Archives. Bundled and bound chronologically, State Papers Ireland are ordered by date. As they are not searchable on our catalogue below piece level, the principal means of accessing the papers remains the published Calendars of State Papers Ireland. The published calendars cover the period 1509-1670 and then continue unsatisfactorily in the Calendars of State Papers Domestic until 1704, when the printed series ends. For 1715-1760, there are unpublished typescript calendars of SP 63 at the Public Record Office of Northern Ireland. From 1760-1775 the State Papers Ireland are included in the Calendars of Home Office Papers of the reign of George III. Each piece number in SP 60-67 is represented in the printed calendars by a Roman numeral at the top of each page which should be converted into an Arabic numeral (for example, vol. CCCX = SP 63/310). The item numbers, which are on the left hand side of each page of the printed calendars and start from 1 at the beginning of each volume, serve only to identify the item within the piece. See section 11 for a key to these margin references. State Papers Ireland for the Tudor period are contained in SP 60-62 and thereafter SP 63 vols 1-215. Calendars of State Papers relating to Tudor Ireland published in the 19th century are considered not fit for purpose on account of the brevity of their entries and the inaccuracy of place name and personal name identification. Ten volumes from 1586 to 1603 can be read on British History Online. 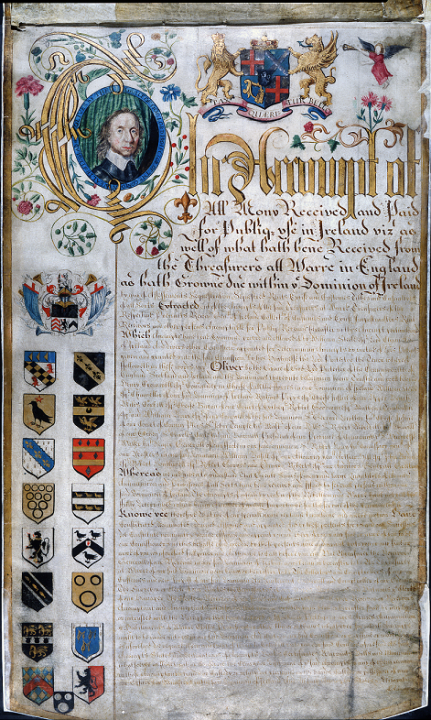 Documents relating to Ireland for the reign of Henry VIII from institutions other than The National Archives are also included in Letters and Papers of Henry VIII. See section 11 for a key to these references. State Papers Ireland for the 17th century continue in SP 63/216-277 (James I and Charles I) and SP 63/303-352 (Charles II and James II). All are available to read on State Papers Online (£) or at The National Archives in Kew on microfilm. Signet Office Letter Books from SO 1 authorising the lord lieutenant or lord deputy to pass Letters Patent under the Great Seal of Ireland. Indexes are also in SO 2 and SO 3. Docquet Books, which briefly surmise the King’s Bills, in SO 3. King’s Bills in SP 39 (which run from 1609-1642 and continue after 1661 in SO 7). A small number of records relate to Ireland in the Secretary of State’s Entry Book in SP 44. For the period 1661-1690, there are similar entry books in SP 63 (SP 63/308, 312, 318, 336, 340 and 341). From 1670 to 1690, there are no specific finding aids for SP 63 and Irish records are incorporated into the Calendars for State Papers Domestic (available on British History Online behind a paywall or available for free in the reading rooms at The National Archives in Kew). State Papers Ireland for the Interregnum run from SP 63/281-302. Administrative matters are covered in SP 63/281-287. These can be supplemented with the Records of the Committee for Both Kingdoms in SP 21/26, SP 21/28 and SP 21/29 and those of the Council of State in SP 25. Alongside them, the Acts and Orders of the Interregnum and the Journals of the House of Commons are the principal sources for the governance of Ireland in this period and both can be found on British History Online. SP 63/288-302 are papers related to Adventurers’ land claims in Ireland and are summarised in the Calendar for State Papers Ireland 1647-1660. They consist of the receipts given to those who subscribed money to parliament under the Adventurers’ Act of 1642 to support the army in Ireland in return for the promise of land, and the subsequent claims made by subscribers to prove their rights to the claim in 1653 and 1654. State Papers Ireland for William & Mary’s reign, and that of Queen Anne, continue chronologically from SP 63/353-372. State Papers Ireland are incorporated into Calendars of State Papers Domestic until 1704 (when the printed calendars finish) and are also searchable on British History Online. ‘Entry books’ in PRO 30/26/60 contain lists of civil and military offices and office-holders c.1698-1717. Privy Council Registers (PC 2/73-84) continue for these reigns and unindexed images are available to read on Anglo-American Legal Tradition website. The State Papers Ireland run from SP 63/372-480 until the Home Office was created in 1782. For the period 1715-1760 there are no published finding aids but the Public Record Office of Northern Ireland holds typescript calendars. From 1760-1775 the State Papers Ireland are included in the Calendars of Home Office Papers via British History Online (£). By the 18th century, it was established practice for the Lord Lieutenant’s secretary to send ‘public’ dispatches – such as formal acknowledgements and requests or routine military matters – to the Secretary of State for the Southern Department, which was responsible for Irish affairs. The Lord Lieutenant himself would send ‘private’ dispatches, often in his own handwriting, to the Secretary on policy and political issues, sometimes endorsed as ‘secret and confidential’ or ‘most secret’ and this is the correspondence now in SP 63. Entry books of letters sent from the Secretary of State to the Irish administration are in SP 67 for 1681-1783 with separate warrant books in the same class for 1713-1776 (before 1713 warrants were noted in the entry books). As with previous reigns, unindexed images of the Privy Council Registers (PC 2/85-128) are available to read on the Anglo-American Legal Tradition website. The Irish Manuscripts Commission has published all known royal proclamations related to Ireland in a five-volume set: Proclamations of Ireland: 1660-1820 (Dublin, 2013) drawing on numerous sources at The National Archives and elsewhere. Throughout the early modern period, numerous Irish people took cases to the English Court of Chancery. You can name-search our catalogue for cases, and the records are particularly rich in land-holding, financial and genealogical detail. The Carte Papers at the Bodleian Library are comprised mainly of the papers of James Butler, 1st Duke of Ormond (1610-88) that were gifted to the Bodleian Library in 1728-29 and added to when Thomas Carte himself departed Kilkenny Castle, the Butler seat, with numerous additions. They sit naturally alongside the State Papers Ireland and often provide the other side of government correspondence to Dublin from London. See the Carte Manuscripts website for finding aids and calendars from 1660-88. The Carew Papers are housed in Lambeth Palace Library and were collected by Sir George Carew during his period in Ireland as President of Munster for the purpose of writing the history of the island from the reign of Henry II to that of Queen Elizabeth. Printed calendars are available, as are further transcriptions that were not included in the calendars in PRO 30/5. The Parliamentary Archives at Westminster is an important source for early modern Irish history. Holdings are divided between the House of Commons and House of Lords and draft bills, speeches and administrative papers related to Irish matters are found there. Likewise, the House of Lords was the ultimate court of appeal for disputed cases originally heard in Ireland. For other archives containing Irish material until 1641, see British Sources for Irish History 1485-1641. A guide to manuscripts in Local, Regional and specialised repositories in England, Scotland and Wales edited by Brian Donovan and David Edwards (Dublin, 1998). See also Sources for early modern Irish history, 1534-1641 edited R W Dudley Edwards and Mary O’Dowd (Cambridge, 1985). Most documents calendared are from the State Papers Ireland. This is noted in the left-hand margin by the entry. For the period 1603-1670, documents are mainly drawn from SP 63, but there are other document sources, as shown in the table below. The left-hand column of the table below lists original references as they appear in the calendars. The right-hand column indicates either the modern National Archives series or other archives and repositories where the documents are held. * Public Record Office of Ireland (PROI), Four Courts Dublin. Contents largely destroyed by explosion and fire in 1922. For description and extent of holdings as of 1919, see Herbert Wood, A Guide to the Records Deposited in the Public Records Office of Ireland (Dublin, 1919) and subsequent Deputy Keepers Reports for accessions to the PROI between 1919 and 1922. Work to digitally recreate the PROI as it was in June 1922 is underway and will be available in 2022 – see Beyond 2022: Ireland’s Virtual Record Treasury. There is an extensive bibliography on early modern Ireland. The following publications are among the most accessible, all available at The National Archives’ Library in Kew. For introductions to the State Papers Ireland, essays on State Papers Online (£) are very useful starting points. Karl Bottigheimer, English Money and Irish Land. The ‘Adventurers’ in the Cromwellian Settlement of Ireland (Oxford, 1971) which lists all Adventurers in appendix.